It's Facebook Fridays! for November 10, 2017, and the power of ancient sorcery is afoot! This week the Lucky Mojo Curio Company is giving away 5 prizes that reach back into the early 20th century history of hoodoo, when African American root doctors worked with a powerful Jewish spirit of freedom to achieve justice and civil rights. 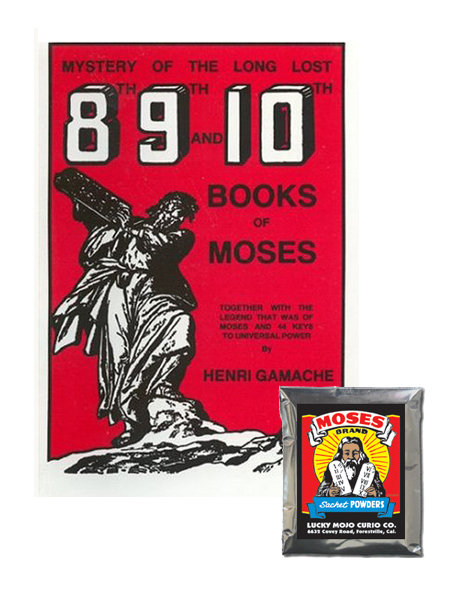 This week each lucky winner will receive a copy of "Mystery of the Long Lost 8th, 9th, and 10th books of Moses" by Henri Gamache, a 1940s conjure classic that tells the story of "Moses, the Great Voodoo Man of the Bible," augmented with practical spells from venerable Coptic and Syrian texts attributed to Moses, the ancient leader and law-giver of Israel -- plus a packet of hand-made Lucky Mojo brand Moses Sachet Powders, for use in dressing your Mosaic and Coptic Seals and Sigils. First thing tomorrow morning, we will select FIVE winners at random, announce their names here, and ask them to message this Facebook Page with their mailing addresses, so we can send them their FREE Moses products.